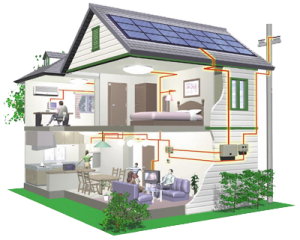 Electric is the fuel of the future for heating requirements. With volatile oil prices and supplies, less and less natural gas and more renewable electricity production, heating your home with an electric heating system will future proof your property Dwindling supplies of north sea gas, the uncertainty of imported gas supplies, the volatility of oil prices and the commitment to reduce the U.K. carbon footprint all point towards electricity as the fuel of the future. The government has set a clear path towards a lower carbon future, with electricity to be generated by nuclear power and sustainable sources e.g. wind power, solar energy, wave power etc. Electric heating is 100% efficient and carbon neutral at the point of use, and with electricity being generated by nuclear and renewable sources in the future it will become completely carbon neutral. The government also promotes the use of micro generation technologies e.g solar panels, photovoltaic’s and wind turbines. Electric heating appliances are compatible with all these micro generation technologies. As more low carbon and renewable sources of electricity become available we will increasingly see electric heating being favoured over gas. Electric heating is very easy to install. There is no requirement for unsightly pipe work, and minimal disruption during installation. 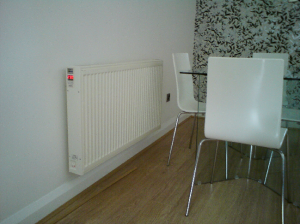 Because each electric radiator can work independently, it is easy to add to a system as necessary or as budgets permit. Also because each radiator is controlled independently from the system, it allows much better control over room temperatures and energy usage than is possible with a boiler based system. Significant developments in electric heating have produced systems with highly accurate electronic thermostatic controls. The Electrorad range offer thermostats capable of maintaining a room temperature to within +/- 0.1 C. This ensures optimum comfort and only the use of energy that’s needed. The Electrorad system makes it easy to meet the requirements of Part L of the building regulations, with highly sophisticated zoned control systems. The true ownership costs of a heating system should be looked at over a system lifetime. Electric heating systems have no moving parts and can be expected to last over 15 years. The boiler industry quotes a lifetime of 10 years for a boiler. Boiler based systems require costly yearly maintenance whereas electric systems are maintenance free. Electric heating is 100% efficient at the point of use meaning all the fuel used is turned into heat unlike boiler systems where energy is wasted through the flue. No Maintenance and no annual inspection. Yearly maintenance and safety checks can add significant costs to the running of a system. Gas boiler systems require yearly maintenance and if used within rental properties, both private and social housing landlords are responsible for annual safety inspections. This can also be a major hassle for landlords needing to gain access to properties to conduct maintenance and safety checks. Electric heating does not require any maintenance or safety inspections.